WASHINGTON (CNN) - Texas Republican Sen. Ted Cruz appears well-positioned for re-election over his Democratic challenger Rep. Beto O'Rourke, topping him 52 percent to 45 percent among likely voters, a new CNN poll conducted by SSRS finds. Just 9 percent of likely Texas voters say there's a chance they could change their mind about the Senate contest before Election Day, although O'Rourke's voters are more apt to be locked in to their choice (92 percent say their minds are made up) than are Cruz's backers (87 percent say they've made a final decision). The President could be an asset among those planning to vote in Texas. Trump's approval rating is net negative statewide, with 50 percent of adults disapproving of his handling of the presidency vs. 41 percent who approve. Among likely voters, however, 49 percent approve of Trump's job performance and 48 percent disapprove. In Texas, the race gap appears more meaningful than the gender gap. Latino voters break sharply in O'Rourke's favor, 62 percent to 35 percent, while white voters favor Cruz by a 2-to-1 margin, 66 percent to 33 percent. Likely voters in Texas place immigration at the top of their issue list: 26 percent call it the most important issue in deciding their vote, while 23 percent call the economy their top priority. Cruz leads among both sets of voters. O'Rourke has a wide edge among the 19 percent of voters who call health care their top issue. Eleven percent say their top issue is national security, 8 percent gun policy and 5 percent the investigation into Russian interference in the 2016 election. Both Senate candidates hold net-positive favorability ratings with voters in Texas generally, and that holds among those most likely to vote. 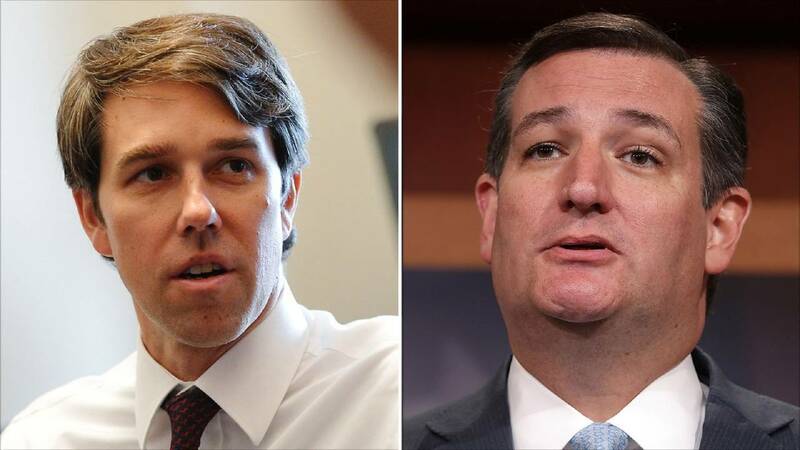 Cruz is viewed positively by 51 percent of Texas voters, 41 percent have an unfavorable view, and O'Rourke is seen favorably by 45 percent, with 36 percent holding a negative opinion. Cruz fares better among his own partisans (92 percent favorable among Texas Republicans) than O'Rourke does with Democrats in the state (81 percent favorable among Democrats). The poll also finds Texas Gov. Greg Abbott standing well ahead of his Democratic challenger in the poll -- 57 percent of likely voters support Abbott with 39 percent for Lupe Valdez.